48 | TH E M R EP O RT O R I G I NAT I O N S E R V I C I N G DATA G O V E R N M E N T S E C O N DA R Y M A R K E T THE LATEST DATA Hurricanes' Aftermath Could Spur Increased Residential Construction The impact of Hurricanes Harvey and Irma on jobs is tallied. T he U.S. Department of Labor released its Sep- tember 2017 Employment Situation last month and according to an industry expert, the areas the hurricanes impacted could boost residential construc - tion jobs going forward. According to the report, non- farm payroll experienced a 33,000 jobs decline, likely due to the hur - ricanes. Food services and drink- ing places also felt the impact with a 105,000 job loss compared to their 12-month trend of adding 24,000 jobs a month. First American Chief Economist Mark Fleming said the good news is that the impact is only tempo - rary and is expected to rebound quickly based on the trends that were seen after Katrina. "Demand for construction workers is likely to reap the bene - fits of the disaster-driven need for repair and rehabilitation demand," Fleming said. "Hurricane Harvey significantly damaged or de - stroyed more than 30,000 homes and Irma similarly damaged over 4,000 homes." Residential construction em - ployment also declined by 3,900 with plumbers, electricians, and other specialized labor associated with renovation projects seeing the brunt of the decline. However, Doug Duncan, Chief Economist at Fannie Mae, said the headline- grabbing drop shouldn't come as a surprise. "The Bureau of Labor Statistics noted that the number of workers who had a job but were not at work due to bad weather jumped to a two-decade high," Duncan said. "The hurricane impact will dissipate over time, as we have observed during the aftermaths of previous major storms." Brett Ewing, Chief Market Strategist from First Franklin Financial Services, said the effect these numbers will have on the Fed and monetary policy could go either way. Though the Fed has said that low inflation num - bers are transitory, their expecta- tions for it to change continue to be pushed out. "In June, [Janet Yellen] said it was a couple-month blip and in her latest press conference, she said it could be a year before it starts showing up," Ewing said. "Translation: they have no idea." The Mortgage-Free Life: Baby Boomers Several economic factors could have contributed to the acceleration of paid off mortgages among boomers. 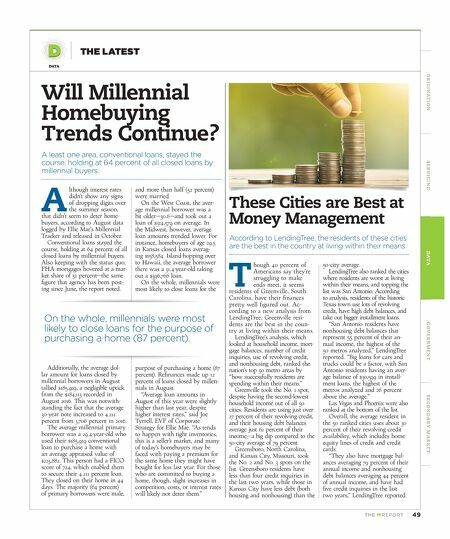 I n their latest article in the Housing Insights Series, Fan- nie Mae delved into which generation was most likely to carry household debt, which is a concern for the financial security of the retired homeowner. Once a widespread rite of pas - sage, the report says, paying off a mortgage for homeowners ap- proaching retirement has become less frequent. Studies have shown a rise in household debt among older homeowners, but hasn't zeroed in on baby boomers and how their mortgage status has changed as they get closer to the age of retirement. The oldest boomers, who are already past retirement age, are substantially less likely to own their homes outright than their generational predecessor. "Among baby boomer owner- occupants aged 65 to 69 in 2015, fewer than 50 percent were mortgage free, down 10 percent - age points compared with the pre-boomer group of homeowners who were the same age in 2000, prior to the housing bubble." Younger boomers, however, are more likely to have free-and-clear homeownership than homeown - ers of the same age in 2000. Of Boomers aged 50 to 54 in 2015, 26 percent owned their homes out- right compared with 22 percent of homeowners who were the same age at the turn of the millennium. According to Fannie Mae, several economic and housing factors could have contributed to the accelera - tion of paid-off mortgages after the housing crisis among boomers. "Some boomers might have adopted a more conservative stance toward housing debt in the wake of the financial crisis and, simulta - neously, tighter credit markets likely constrained the ability to borrow against the home," the report said. Additionally, the recovery in housing prices and gains in equity that followed the housing bust allowed boomers to move and downsize to lower-value homes without using mortgage financing. 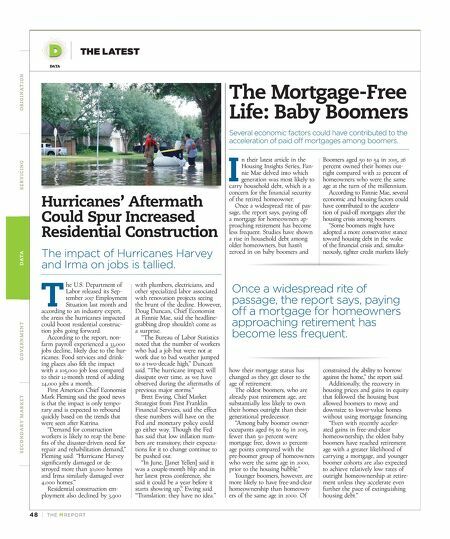 "Even with recently acceler - ated gains in free-and-clear homeownership, the oldest baby boomers have reached retirement age with a greater likelihood of carrying a mortgage, and younger boomer cohorts are also expected to achieve relatively low rates of outright homeownership at retire - ment unless they accelerate even further the pace of extinguishing housing debt." Once a widespread rite of passage, the report says, paying off a mortgage for homeowners approaching retirement has become less frequent.